The Edmonton Humane Society has over 1,000 active volunteers who contribute an average of 50,000 volunteer hours annually. Without this contribution, the Shelter would not be able to do the work we do. Volunteer opportunities range from cat cuddling and dog walking to volunteer photography and help with major fundraising events, with many other opportunities in between and beyond. We foster a volunteer culture that is inclusive and positive, where new people are welcomed and seasoned veterans are happy to mentor. It truly is a wonderful place to contribute time and make a difference in the community. 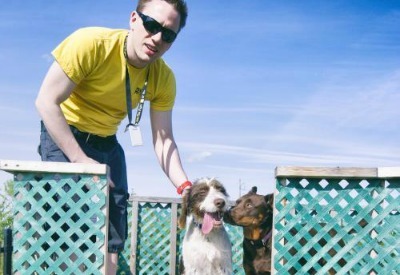 Shelter volunteers help with the day-to-day operation of the Edmonton Humane Society. You can help the animals at the Edmonton Humane Society by opening your home to foster care and giving them extra attention before they are placed for adoption. The Edmonton Humane Society offers a one-time volunteer opportunity for corporate organizations. Corporate organizations offer valuable assistance in the day-to-day operations of the shelter. We are always looking for dedicated volunteers in a number of different capacities. We require that volunteers commit to 4 hours a month.